The newsletter idea is that anyone with 15 minutes to spare can learn about our work and its application in everyday life. In our second issue of 2014 (Vol. 3 Num. 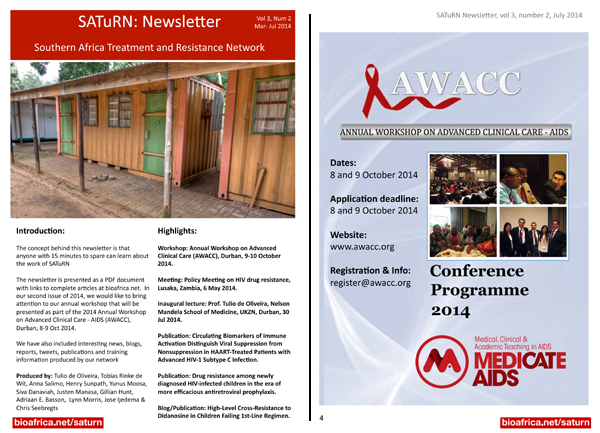 2), we advertise our annual workshop, which will be presented as part of the Annual Workshop on Advanced Clinical Care - AIDS (AWACC), Durban, 8-9 Oct 2014. We also included interesting news, blogs and publications produced by our network and partners. Positions available! 6 Post-Doc fellowships in HIV research at Wellcome Trust Africa Centre. Workshop: Annual Workshop on Advanced Clinical Care (AWACC), Durban, 9-10 October 2014. Meeting: Policy Meeting on HIV drug resistance, Lusaka, Zambia, 6 May 2014. Inaugural lecture: Prof. Tulio de Oliveira, Nelson Mandela School of Medicine, UKZN, Durban, 30 Jul 2014. Publication: Circulating Biomarkers of Immune Activation Distinguish Viral Suppression from Nonsuppression in HAART-Treated Patients with Advanced HIV-1 Subtype C Infection. Blog & Publication: High-Level Cross-Resistance to Didanosine in Children Failing 1st-Line Regimen in South Africa. Our active and well attended seminar series! We hope that you enjoy our newsletters. We think that they are truly interesting and we really have enjoyed producing it!